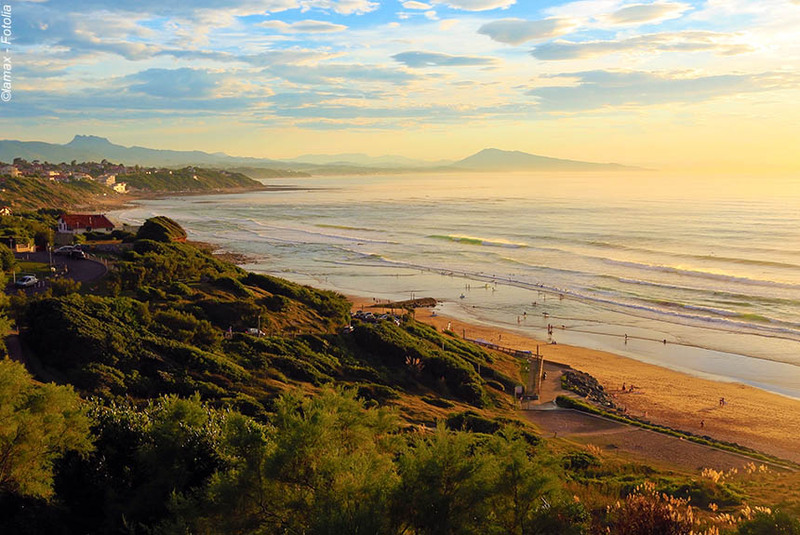 This short break takes you through the foothills of the Pyrenees to the Atlantic Ocean, discovering the green and gentle landscapes of the Basque Country as you go. 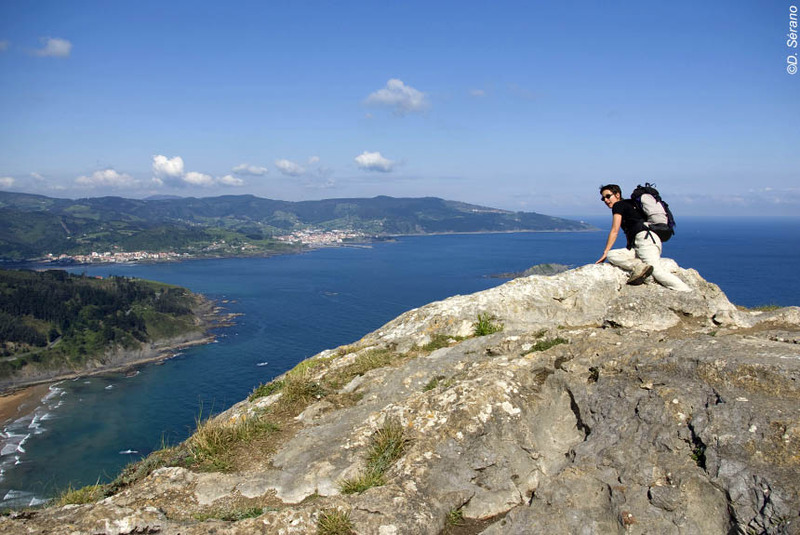 Highlights include the spectacular viewpoint of La Rhune and the Basque talent for great food and hospitality. 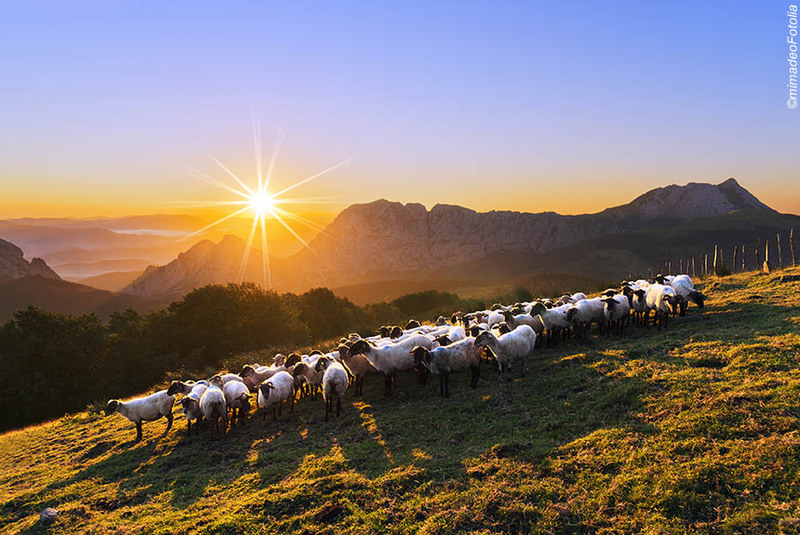 On this short break, you discover the true Basque Country - its superb peaks, its green valleys, red and white villages, and the satisfaction of walking to the Atlantic Ocean. At the end, you stay in one of the region's liveliest and most attractive ports. We meet you at Biarritz airport or the railway station in Saint-Jean-de-Luz (trains from Paris). Pick-ups also available from Pau or Bordeaux (please consult us for prices). Depending on your time of arrival, you can enjoy a pleasurable 1.5 to 2 hour stroll around Mount Urzumu, which offers panoramic views of the village of Espelette. There is also the option of a much longer, 5 hour walk if you were to arrive early enough. 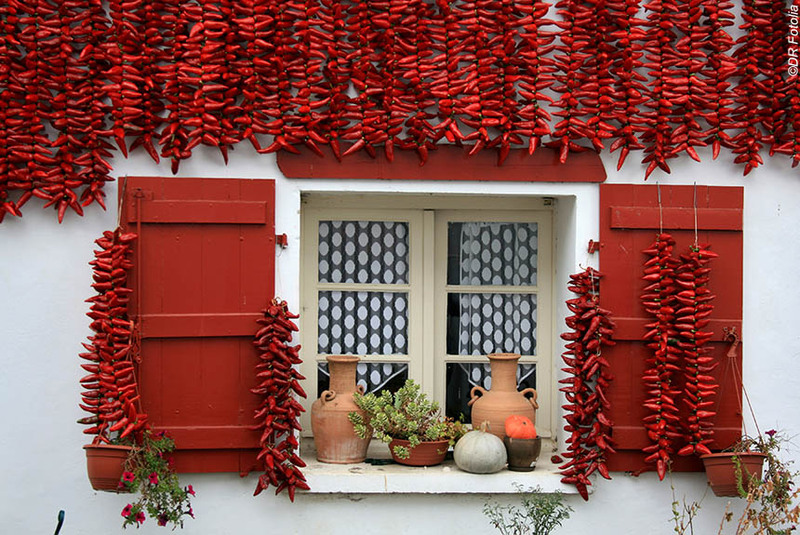 You stay in the archetypal Basque village of Espelette that has been conserved superbly, has an interesting chateau and church, and an exceptional artisan chocolate producer (Antton), but is really famous for its festival of red peppers (pimentos). Hotel Chilhar is a real treat in the heart of Espelette. Outside it is traditional Basque. Inside it offers boutique style accommodation, and wonderfully contemporary takes on traditional Basque cuisine. We are sure you will really enjoy staying here. Dinner, bed and breakfast. Walking time: 1h30 or 5h. Distance: 6km or 16km. Ascent/descent: + 100m or + 600m / - 150 or - 650m. Transfer time : 30 minutes. This is a day of wonderful foothills walking through unspoilt villages and hamlets, and along country lanes and farm tracks - the remarkable Ainhoa being the highlight. It is easy walking through beautiful countryside, but interspersed with interesting places to see and things to do, not least from tempting artisan producers of foods, drinks, arts and crafts. But often you will see, not that far away, the dramatic mountain that is La Rhune,and which you will be on top of tomorrow. A longer, and somewhat more challenging, route can be chosen instead. You stay in Sare, which has 253 houses dating back to the 15th century, and rests almost in the shadow La Rhune. The Hotel Arraya is a superb 4 star hotel in a privileged location in the village that combines an historic building with boutique luxury and exceptional "cuisine terroir". Walking time : 6h30 or 5h30. Distance : upto 19km. Ascent/descent: + 620m / - 760m. 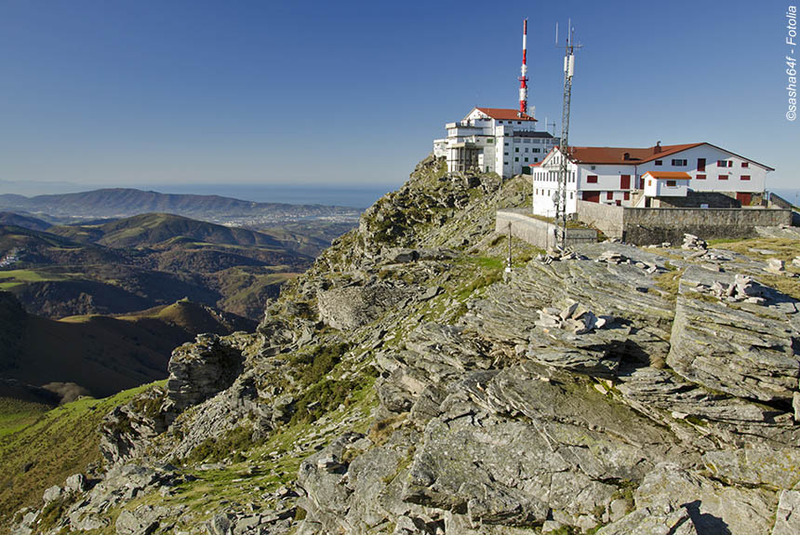 Your panoramic highlight is at the summit of La Rhune with its 360 degree views east towards the endless Pyrenees, south into Spain, and west to the Atlantic coast. You can walk up - a steady walk that's perfectly "do-able" - or take the magnificent rack railway, its wooden carriages slowly clattering their way to the top. Look out for pottoks - wild mountain ponies - and red headed sheep. Certainly you can enjoy the walk down until you arrive at the pretty village of Ascain.We will then take you the short distance to St Jean de Luz by road, or you can kayak down the gentle Nivelle river to arrive in St Jean in independent style. As ever with Purely Pyrenees, the choice is yours. St Jean de Luz is one of our favourite - and liveliest - towns in the Pyrenees bursting with energy from its harbourside through its twisting streets to the bars and restaurants, many offering tapas as well as excellent fish dishes. You stay in the middle of the town at the impressive and comfortable Hotel les Almadies on a bed and breakfast basis, so you can choose your own restaurant (or series of tapas bars), although we offer several recommendations. Walking time : 3h30 or 6h. Distance : 10.5km or 15km. Ascent/descent:: + 500m or + 880m / - 500m or - 840m. Transfer time : 20 minutes. Your last walk is a coastal one to complete your mountains to the sea experience. You walk out of St Jean de Luz, and walk the rich green hills around Urrugne that run close to the often dramatically magnificent Atlantic. Your return route is right by the sea through the interesting villages of Socoa and Ciboure. Altogether, a thoroughly satisfying walk with plenty of memorable views, places to stop for a coffee or something more substantial, and throughout that distinctive Basque ambience that is like nowhere else in France (or the rest of the world). Walking time: 4h30. Distance: 16km. Ascent/descent: + 250m / - 250m. After breakfast, we will take you back to Biarritz airport or the railway station at Saint-Jean-de-Luz. Transfers also available to Pau and Bordeaux (please consult us for prices). This itinerary features comfortable rather than challenging walking, and is suitable for most people who enjoy a good walk. You are mainly in the foothills of the Pyrenees rather than in the high mountains, and on most days there are itinerary choices, so you can choose easier or more challenging routes.Typically, there is 4 to 6 hours steady walking with ascents and descents of typically 200 to 800 metres. If the weather is really bad, or you are really tired, then we can usually transfer you to the next hotel by car. You stay in double or twin rooms for 1 night in four star hotels, 2 nights in a three star hotel, and one night in a particularly good two star hotel. You will eat very well. The two included dinners are based on set menus featuring regional specialities, fish etc usually with 3 or 4 choices for each of three courses, but you can pay locally for upgraded choices. The dinners on the last two nights are not included. Breakfast is included every morning, but lunches and picnics are not because there are plenty of places to make your own choices, although the night before you can ask the hotel for a picnic, which you can pay for locally. 2 nights dinner, bed and breakfast, plus 2 nights bed and breakfast; people transfers; luggage transfers; detailed walking instructions; 1:25,000 IGN map; 24/7 customer phone service. 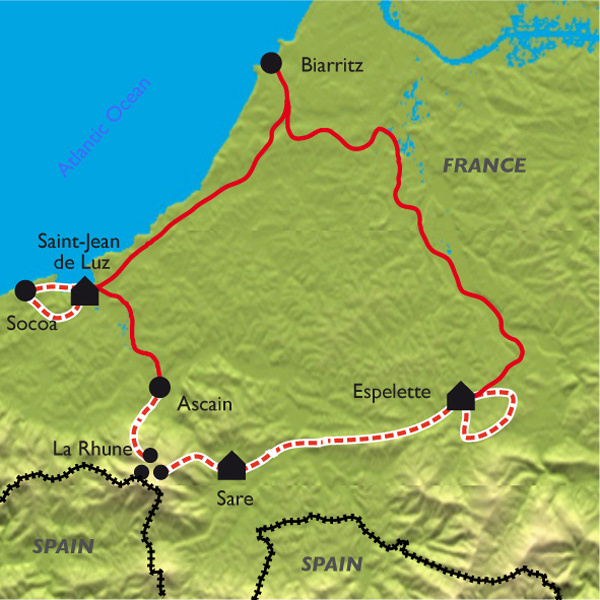 The journey to the start point, and from the finish point, except as specified; lunches; drinks with meals; non-standard menu items; the La Rhune train tickets; personal and travel insurance. All our walking holidays "Short breaks"